RIT students march in the Tiger Walk to the Convocation for New Students in the Gordon Field House Wednesday. A record 2,940 freshmen have enrolled this year. 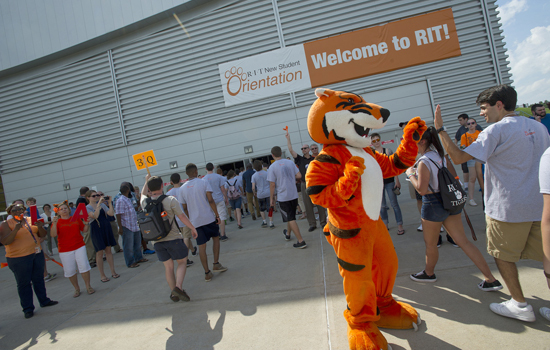 Rochester Institute of Technology this week welcomes a record freshman class of 2,940 students and about 600 transfer students, bringing its total enrollment to more than 18,500 students. Jeremy Haefner, RIT’s provost and senior vice president for Academic Affairs, welcomed students and their families at convocation ceremonies Wednesday. Enrollment figures are preliminary. Yet college officials say projections show the academic quality of the freshman class is higher this year, and its diversity is greater. About 53 percent of the freshman class is from outside New York state, with the leading states from outside New York being Pennsylvania, Massachusetts, New Jersey, Connecticut and California. There are 174 freshmen from other countries, up from 112 last year. The leading countries are China, India, Canada, Nigeria and Pakistan. And RIT this year has about 3,100 graduate students, up about 2 percent from last year. Sixty percent of graduate students are from outside the U.S., with students from India, China, Saudi Arabia and the Dominican Republic leading the global enrollment. Keynote speaker was Joe Williams, a criminal justice lecturer in RIT’s College of Liberal Arts, who won the Outstanding Teaching Award for Non-Tenure Track Faculty this year. He told students to prioritize, make sacrifices and get help when they need it. RIT Student Government President Nick Giordano told students to get involved in some of the more than 200 clubs and organizations on campus, and take advantage of things like bike rentals, wellness classes and leadership opportunities. He told students they can always rely on the RIT community for support when they need it, from faculty, staff and fellow students. Nick Giordano’s full speech is available at https://www.rit.edu/news/story.php?id=52934. Joe William’s full speech is available at https://www.rit.edu/news/story.php?id=52939.